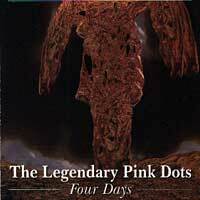 The Legendary Pink Dots, "Four Days"
First pressing was limited to 1000 copies and distributed mainly through direct mail order from the Dots. 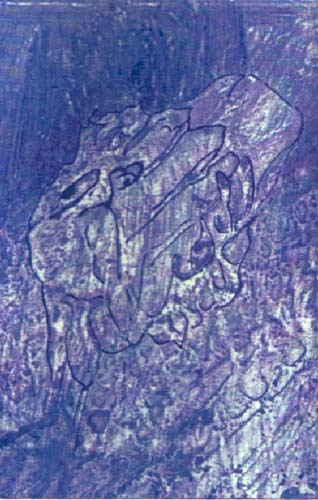 In August 1995, 200 extra copies were pressed; a second re-pressing of 500 was made in 1996 mainly for the American market (distributed by Soleilmoon); and there have been several editions since. "Nadelstadt" was retitled from the original release (where it was called "City of Needles") since it appears in another form as "City of Needles" on SHADOW WEAVER. 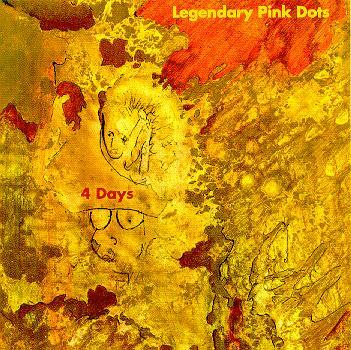 As the title suggests, "Four days" was a work conceived and recorded in an intense but well starved short period of time in 1988. On the fifth, Elke made the cover for the original tape release, while the results were presented to long term Dots friend, Henk, before the week elapsed it was to be a limited edition of our copy - a musical 'tHenk you' for a precious favour. Trouble is, we all liked the music and artwork too much to keep it under a carpet. Consequently, with the blessing of Henk, 'four days' was released in an edition of 100 numbered copies on casette only. by the time most people found out about it, 'four days' was four years ago - that's why it is re-appearing now, again with Henk's blessing. This time there are 1000 of them... it will not rear its head again. Dedicated, of course, to Henk. Thank you to PIAS records for their blessing of this release. Klymnyeh - Sing while you may! One source says that the Chinese characters translates loosely as "Your Word Means The World To Me", while another says that it means "Your Chinese Really Has Improved". It's possible that the title was changed for different pressings. SPV Poland's website lists the above mentioned track as "Your Chinese Has Improved". In the interest of you all - the living and the temporarily indisposed I retire. You know, I had such ideas... When you are alone, with eternity to play with, to shape, to build - well you can understand the weight of my ambition. But I've created a monster, that was never the intention. The bureaucracy of my vision has now made it impossible to realize the totality of the vision itself. Merely a few friends, as equals. No delusions of grandeur. No pity, narrow winded struggles for "power" I'm sorry, it isn't possible. I can't cope anymore. As I said before, I retire. you took my soul away snatched it and stole away stashed in a hole with a sack full of gold for a cold rainy day, gonna wash me away. Chasing the tail of a soft spoken whale in a gale in a flood. I got it in my blood. Gonna slice up my brother. I'll slice up my brother. I'll cater you. And nothing makes sense, I'm a hole in a fence and this planet's immense and expensive. I'm broke but I'm broken oyu push in a token you pull on a whul(?) It's no deal. It's a death. It's no deal wish a death it's no deal.